The second volume of Prime Books’ annual anthology series collecting some of the year’s best novella-length science fiction and fantasy. Novellas, longer than short stories but shorter than novels, are a rich rewarding literary form that can fully explore tomorrow’s technology, the far reaches of the future, thought-provoking imaginings, fantastic worlds, and entertaining concepts with all the impact of a short story as well as the detailed depth of a novel. 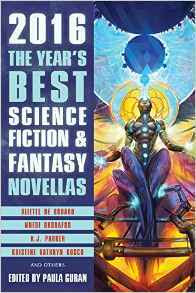 Gathering a wide variety of excellent science fiction and fantasy, this anthology of “short novels” showcases the talents of both established masters and new writers. If you think novellas are snack sized pieces of full-meal novels, be prepared with an empty stomach for this awesome collection. The 2016 volume of Year's Best Science Fiction and Novellas will leave you unhitching your belt a notch (or three) and you might want to pace yourself for this assortment of dark themes and tight and thorough world building. Each novella is so well done and dense with well formed plots they have as much action and personality as I'd expect to find in a novel. This gives each of these stories a sense of urgency and completeness we don't always see in this size of works. My absolute favourite character is Maurice in The Bone Swans of Amandale. He's a loyal and sarcastic rat-shifter and in his own way, an adorable and (as you'd expect from a rat) kinda gross anti-hero. This wide selection of dark novellas is well worth exploring and feels more like a bundle of complete novels than shorter works. I'll be diving in to the 2015 edition and keeping my eye out for the next one.